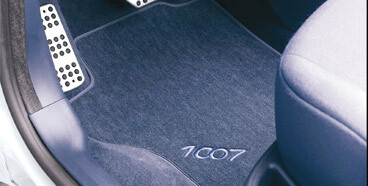 Homepage > PEUGEOT 1007 LUXURY CARPET MATS [Fits all 1007 models] 1.4 1.6 & HDI NEW! PEUGEOT 1007 LUXURY CARPET MATS [Fits all 1007 models] 1.4 1.6 & HDI NEW! Luxury carpet mat set - anthracite . Offers the same protection as the standard mats, with the benefit of a more luxurious pile. Embossed with 1007 logo. Product Description: Luxury carpet mat set - anthracite . Offers the same protection as the standard mats, with the benefit of a more luxurious pile. Embossed with 1007 logo. Product Fitting Note: Front and rear pair. PEUGEOT 1007 BOOT PROTECTION TRAY [Fits all 1007 models] 1.4 1.6 & HDI NEW! PEUGEOT 1007 SILL GUARDS PROTECTORS [Fits all 1007 models] 1.4 1.6 & HDI NEW!